Jane’s special day had come again and she bounced through the house with renewed vigor. It seemed like a lifetime had passed since she felt this strong. Her illness had dissipated. An old memory skittered back to her like flipping to a page in her blue velvet album. “Where is everyone? No matter. 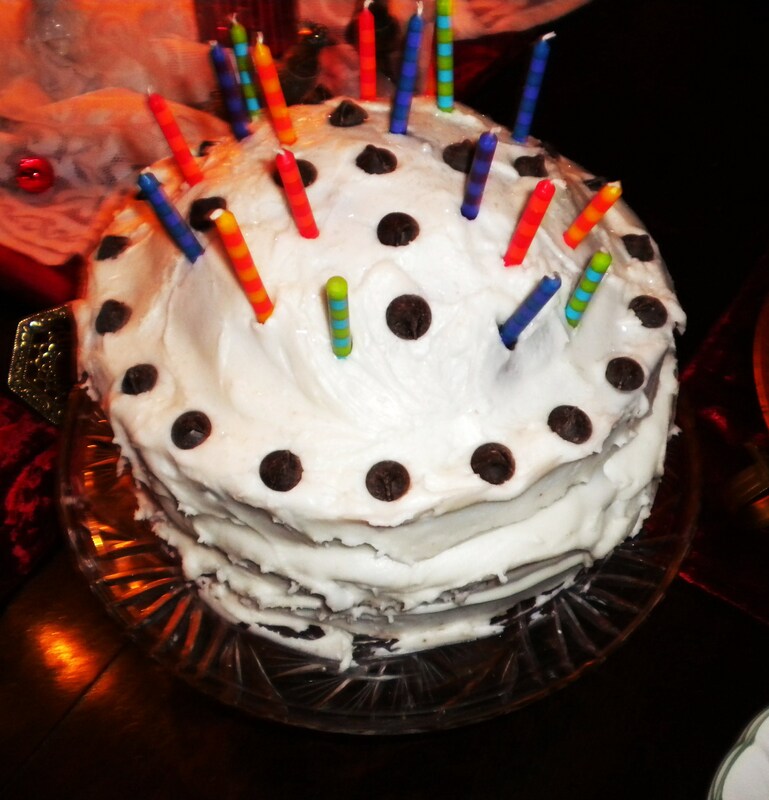 I’ll make my own birthday cake.” Jane hummed as she opened and shut the painted cupboard doors searching for the familiar ingredients. It is a big birthday month for our family so I thought I would give all of my loved ones a big shout-out with a paranormal twist! Happy Birthday Danny, Kelly, Patty and Marilyn from your twisted wife, mother, sister and daughter-in-law! There are more birthdays this month than any other during the year. Are you celebrating any November birthdays? Oh, this was fun! Just the kind of surprise I love!!!! Happy Birthday to all the November babies!!! I smell cake! Chocolate cake! We have all our birthdays in Dec & January so just keep the party going! Happy Birthday to your family members! Thank you! We have a couple in December too! Thank you Jan! I am working on that since I am writing paranormal fiction book and like to practice. Wonderful birthday story. My grandson turns 4 on Tuesday and mine is on Wednesday. I’ll have to show him that Three Stooges clip–he’ll get a bang out it! Thank you! Hahaha! I am sure he will! I loved this.My dear departed mother’s birthday was November 15 and we still celebrate and remember her life that day. My great nephew is the 16th and my great niece’s is the 29. Thank you! November is the biggest birthday month. I hope you have a wonderful month celebrating all of them! This was fun, love the skittering, Victorian, humming. Thank you! This one was easier to manage and I had room to describe which I very much love to do in my fiction. I, too, am a full blooded Scorpio. I’ll be 44 next week on 11/18. Ack. Glurg. When did this happen? When is YOUR b’day, darlin’? Happy almost birthday! I just got back from celebrating with my sister. Mine isn’t until April and would love to be 44 again! Hahaha! Another scorpio here 🙂 Mine’s next week, too, on the 15th. Are you a November gal, too? Loved how subtle your paranormal was – felt normal until the last sentences! Mine isn’t until April. Could you tell I was an Aries??? Headstrong leader-type – lol! Thanks! I love to put in a little twist when I can~ Hahaha! You gotta believe all kinds of shenanigans go on in that kitchen! lol! That is so great that your birthdays are far away from Christmas! I enjoyed your story – felt like I could see it happening! 🙂 Best birthday wishes! Mmm… Now I want cake! 😉 Thanks for the story, Susie! And happy birthday to all. My dad, brother-in-law, two friends and 2 nieces had their birthdays this past week. Whew! And my youngest sister had her first baby. Lots to celebrate indeed. Cake…here I come! Thanks for stopping by for a slice August! You know what I mean then because from here we go right into Christmas~ My daughter’s birthday is December 28th! Off to make another cake! Cake or death? Now who said that? I love flash fiction, such a great way to get the creativity flowing! And what better way to start than with Birthday Cake! I enjoyed your post and wanted to eat your cake. 🙂 Happy Birthday to all the folks in your world who are celebrating! And, happy writing! Thank you Pamela! I am glad you came by for a slice! Hahaha! I will pass along the birthday wishes! Very fun! I loved it! No November birthdays here. But we got one coming up right at the beginning of December! Well you have a little time to prepare then! That’s the best piece of flash fiction i’ve ever read – Wow! Wow Catherine! Thank you so much! The Patterson book looked great, but they all looked fabulous! Great work! You have a gift, young woman.